The active gentleman with impeccable taste will love the TAG Heuer Aquaracer Two-Tone Chronograph Watch CAP2120.BB0834. Its classy and functional design allows its wearer the options of using it as a timepiece or as an aid in a variety of outdoor activities. At first glance, the dial of the watch looks overly intricate. Upon further inspection, one can see a variety of important functions, mainly the chronograph function that allows specific timekeeping. Its three sub-dials provide up to twelve hours of timing. 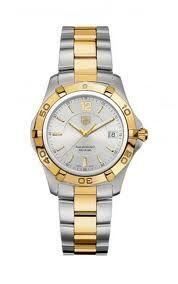 The date function at the 3 o’clock marker is important for any active man, and the TAG Heuer emblem next to it authenticates the watch as one of true quality. The horizontal lines on the background of the dial add a sporty look to this elegant watch, which is made in particular for divers. The luminescent hour markers and hands provide a bit of light when diving into the depths. The chronograph function also supports the needs of a diver, but in addition, the uni-directional bezel can serve as a sort of timer as well. Because it is so important to know how much time has passed when diving, the bezel can only be moved one way. If it is bumped or moved, it can only reduce the amount of remaining time, not increase it. The bezel itself has six large studs, which makes it easy to move even with diving gloves on. Unlike other luxury watches which sometimes have too few numbers, this watch has an overabundance of them. If you do not need the extra numbers in order to supplement your activities, you may find them cumbersome. If you are in need of the chronograph feature, then you’ll surely appreciate the added ability this watch provides. 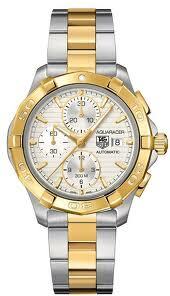 Another thing to beware of is that some online retailers list this watch as having a water resistance up to 500 M. However, it is clear on the watch face itself that the water resistance is only 300 M.
It is available from online retailers starting at $2,175 at Steindiamonds.com. A more reputable retailer, Nordstrom, also advertises the watch online for $2,900, which is the suggested retail price. These other designs are available from online retailers from between $960 and $1,300. The TAG Heuer Aquaracer Two-Tone Chronograph Men’s Watch is an amazing timepiece that combines design, functionality, and quality. It provides the elegance necessary for the boardroom and the practicality necessary for underwater adventures. For the active professional man, there is no equal.